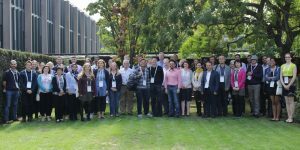 The event took place from Monday 3 to Tuesday 4 September 2018 at St Catherine’s College, University of Oxford, UK. Posted on July 5, 2018 December 7, 2018 Author egiotisCategories UncategorizedLeave a comment on Meeting: Molecular biology and pathogenesis of avian viruses in from Monday 3 to Tuesday 4 September 2018 at St Catherine’s College, University of Oxford, UK. This Focused Meeting on “Molecular Biology and Pathogenesis of Avian Viruses” will take place on 27-29th September 2016 at Charles Darwin House, London, UK. Avian viruses have contributed immensely to our understanding of not only virology but important aspects of biology including cancer, immunology and cell biology. In recent years, the role of birds as sources of important zoonotic viruses (avian influenza, West Nile, Japanese encephalitis, the equine encephalitis viruses) has become apparent. Poultry (reaching a global annual population of around 55 billion chickens) are also increasingly important as a universally acceptable source of protein for a growing world population. With a plethora of viruses, with frequent occurrence of emergence of novel pathogens and continuing diversity, the vaccination strategies widely used by the industry are being challenged. With significant growth of the poultry population happening in Asia and South America, where emergence and re-emergence of avian viral pathogens is often observed, this timely meeting focusing on avian viruses will bring together the international scientific community to assess the extent of the problem and help find solutions. Those working on key, often novel, aspects of the molecular biology and pathogenesis of a range of important avian viruses will join others studying host-virus interactions using genetics, genomics, transcriptomics and proteomics, especially in the study of the innate (particularly interferon) responses. Organisers: Dr Mike Skinner (Imperial College London, UK) and Professor Venugopal Nair (The Pirbright Institute, UK). For more information visit the Microbiology society’s website.